This being the tenth volume of The Sandman, it’s hard to write about this without ultimately spoiling anyone. A lot of things have changed via the ending of the previous volume, and Gaiman is wrapping things up and saying some goodbyes. This is a weird review to write. I’ve been spending the last, several years, since I got into Gaiman, reading my way through The Sandman. As a result, this was pretty bittersweet. 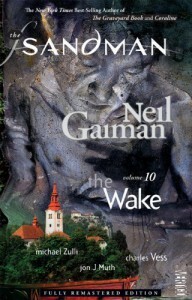 Dream has changed forms, and the title of this volume, The Wake, rings true. Everyone who ever knew Morpheus is showcased here, with glad and sour memories of him mixing all together in this big bowl of emotions. It was hard not to feel a pang, because this clearly wasn’t just his goodbye. It was for the reader, as well, and it was felt. The last comic that rounds out the entire series really was a nice touch. 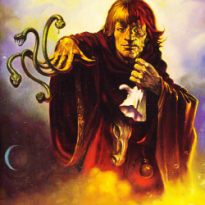 It was Gaiman returning to the storyline that made The Sandman so famous in the literary crowd with a play on William Shakespeare’s The Tempest and the playwright’s life, his mission to write plays for Morpheus. In wrapping that subplot up, he manages to do the same for the series as a whole, and it makes for a lovely final farewell to Dream and his realm. I wish I knew what else to say, but this volume was short and mostly nostalgic for someone who’s been working through the series as I have. It’s sort of a personal journey, ending something so big like this, and not something I can critique the merits of with anything other than the verbal equivalent of a sad smile. I do still have Endless Nights ahead of me. That’s a comfort.